It has been awhile since I've been able to create a blog post! I have decided to share about my return with a giveaway for my readers. Dial has introduced another innovative product to their extensive product line. If you have read my blog posts about Dial in the past, you may remember my fondness of their products. This company never ceases to amaze me with the products they continue to invent. I'll never get bored by using the same product from this company. There are way too many to choose from! An additional bonus is that you can color coordinate with your bathroom theme! I love getting the most for our hard earned money. Dial products are quite affordable without sacrificing quality. In addition to affordable prices, coupons are often available in Sunday newspaper inserts. The health of my family is important to me, and I try to keep a few bottles of hand soap available at all times. Dial's Sugar Cane Husk Scrub smells absolutely delicious! The scent features a delectably sweet aroma. This hand soap has a creamy color and slight sugary textured feel. There are micro-scrubbers mixed in with the soap are formulated to gently scrub your hands. I have thoroughly enjoyed this product. My hands are generally dry, especially during seasonal changes. This product lathers well and rinses from the skin easily. My hands feel soft and moisturized after using the Sugar Cane Husk hand soap. In addition to using lotion, I utilize moisturizing products as well. If someone wanted to look behind my shower curtain, they would usually find a bottle of moisturizing body wash as well. I'd love to see a Dial body wash with this scent. I know how important it is for some to know the ingredients of products that they will be using. I have included them below. Ingredients in the other hand soaps from this line are available on the product website. In addition to the Sugar Cane fragrance, other scents available from the Deep cleaning moisturizing hand soap line include: Yellow Raspberry and Black Sugar, Water Blossoms, and Coconut Lime Verbena. My family has tried every scent in this line. We found coupons hanging from these products when they were first introduced (except Sugar Cane). Our top recommendations are the Sugar Cane and Water Blossoms. 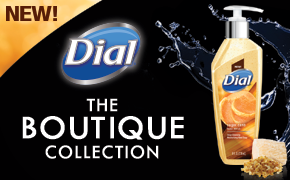 Would you like to win a coupon for a FREE bottle of Dial hand soap? Enter the giveaway tool below for your chance to win. -Giveaway ends 4/05/15 @ 11:59 pm CST. A winner will be randomly chosen and contacted via email. Winner will have 48 hours to respond with shipping information. If winner does not respond within 48 hours, a new winner will be chosen. I will personally ship the prize out for this giveaway. Disclaimer: The Dial brand sent a sample of Dial Sugar Cane Husk Scrub Hand soap in exchange for this review. However, all opinions are my own and true. My favorite is Triple Moisture Shea, Jojoba & Mango Butter Ultra Moisturizing Body Wash. I like the coconut water body wash. I like Dial Vitamin Boost body wash.
My favorite Dial product is their Lavender and Twilight Jasmine body wash. I am a big fan of the Lavender and Twilight Jasmine body wash. Right now, we use Dial bars; but I would like to try the exfoliating body wash. I use Dial Bars and Dial body wash right now, I love them both! i love the sugar cane wash! 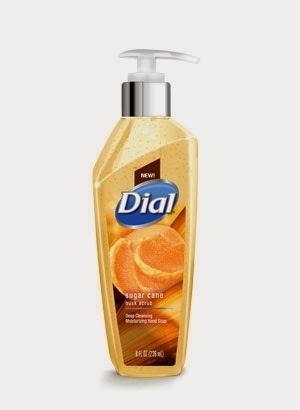 I'd like DIAL body wash. I want to try this product because I think it will be good for my hands after gardening. I'd like to try the Lavender and Twilight Jasmine body wash. I like the Dial Coconut Water Body Wash. I want to try the Dial Sugar Cane Husk Scrub Hand Soap. I like the Lavender and Twilight Jasmine Body Wash. I like Dial Body wash. My doctor prior to my surgery, recommended washing with Dial. He must know how well it cleans. I love their Coconut Water Body Wash. I have the Dial Cocoa butter as we speak in my bathroom. I love the smell and it does not dry my skin out. I sometimes match the decor. I think the coconut water body wash sounds pretty luxurious. I would love to try the Lavender and Twilight Jasmine Body Wash. I would like to try the Deep Cleansing Water Blossoms Liquid Hand Soap. I would like to try the Lavender and Twilight Jasmine Body Wash. I love the Himalayan Pink Salt & Water Lily body wash!